PHUKET: Nature has made a grave statement across the Asian region this past week, in which nasty weather and subsequent widespread flooding have left thousands dead and tens of millions inundated or displaced, from India, Pakistan and Myanmar to the Philippines, Vietnam, Taiwan and China. Thailand, which geographically lies in the middle of all the havoc, has not been exempt from the deluge. As the Pacific-borne super-typhoon-turned tropical rainstorm “Soudelor” made landfall in China this past week, weather warnings were issued for several provinces in the kingdom’s Northeast, while this season’s particularly strong southwesterly monsoons have continued to batter Andaman Sea coastal provinces. Here in Phuket, we’ve been subjected to a relatively small taste of the August fury, so far. 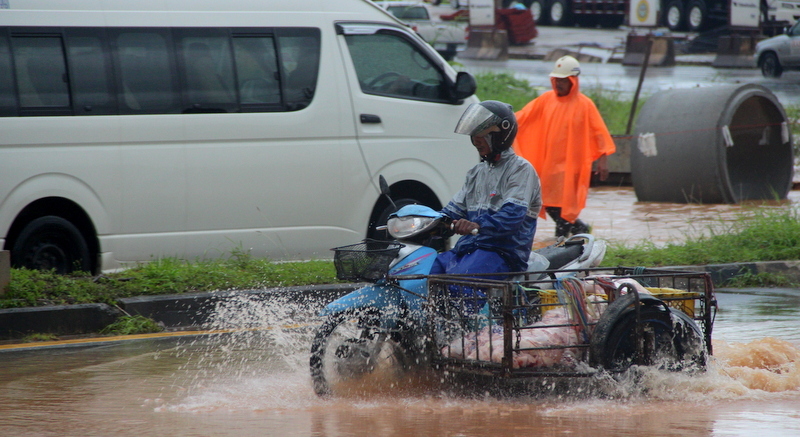 Last Friday (August 7) commuters were caught in two-hour-long traffic tailbacks amidst flooded roadways while distressed villagers in Nai Yang were displaced as metre-high floodwaters breached their low-lying homes (See story here). While some officials have suggested that the traffic, flooding and rubbish accumulation on Phuket beaches were all a result of the run of nasty weather, The Phuket News would like to humbly highlight the actual underlying cause and source: Us – you, me, them! Indeed, humans are to blame for most of our own misfortunes, and more specifically our shortcomings and incompetencies when it comes to planning and prevention. The weather didn’t discard the fishing nets and polystyrene into the sea – people did. And while the rain did come down hard on Nai Yang, as it does this time every year, the flooding was a result of inadequate and clogged drainage systems. As for the notion that rain causes traffic, is it not a result of chaotic roadworks and the addition of tens of thousands of new vehicles to the island’s roads every year, coupled with inadequate public transport? No one will argue that the rain does not make a bad situation worse, but Phuket, like much of the region, needs more accountability. Blame it on a lack of budget, infrastructure or plan, but please, don’t blame it on the rain. Well said! The sea has returned our Garbage which needs to be removed & not be permitted to be washed back out to sea. We all know that the seemingly unstoppable construction of condos & hotels without adequate infrastructure is the fault of the Thai Local Government! When the rainy season starts they gullies are blocked.